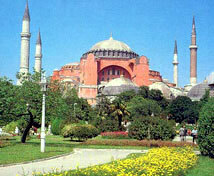 Haghia Sophia Museum, the great masterpiece of Byzantine art. It was built by Justinian in 6th century AD and is the 3rd church to occupy this site. At the time it was built, it was the largest church in existence. The church was sacked by the Latins during the 4th crusade in 1204 and many of its treasures taken to the west. When Contantinople (Istanbul) was conquered by the Ottoman Sultan, Mehmet II in 1453, it was converted into a mosque. Since 1936, by Ataturk's order it has been a museum. The interior is decorated with wonderful Byzantine mosaics from 6th to 13th century AD.